I wish I’d thought of that. Operation Starbucks. I should have thought of it first. 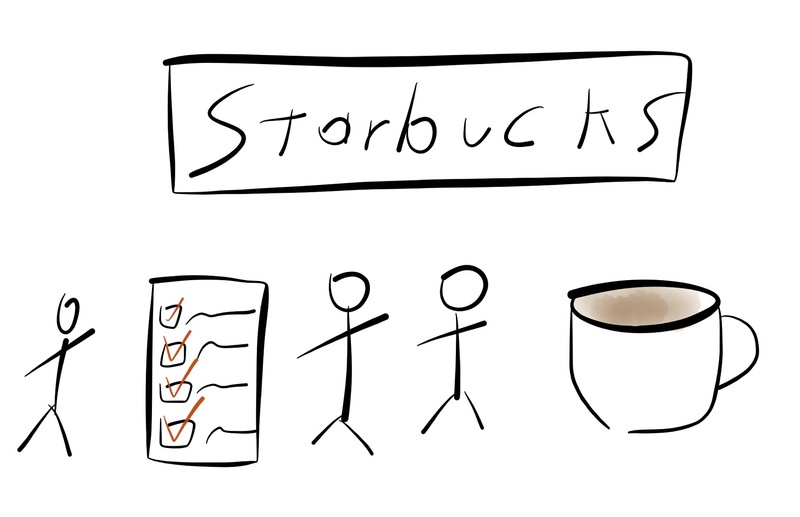 I walked into Starbucks one afternoon. Ok. Ok. I do this every afternoon, but something was different this time. Something really neat was going on. I’ve never been shy of giving people feedback. I don’t have a great filter and before KickoffLabs made any money free coffee sounded good to me. Jim saw me coming out of the corner of his eye and stopped what he was doing to introduce himself. He was working on an educational iPad app to teach kids basic math. He asked me to play through a couple of levels and tell him what I thought. Don’t forget to get email addresses for people that come by. They could become customers and evangelists. He never asked if I’d give him money today for it. He got feedback from someone he didn’t know would be a paying customer or not. He didn’t even ask me if I had kids. I’ve also heard this works just as well before you write any code. Use the cards to get people to take a survey and validate some of your assumptions before you build anything. I wish I’d thought of it sooner.